Dr Petersen is a native of Los Angeles, California. She received a Doctorate of Optometry Degree from the Southern California College of Optometry in May, 1998. After working as an Optometrist for Kaiser Permanente of Southern California for six years, She relocated to the DC Metro area in 2004. 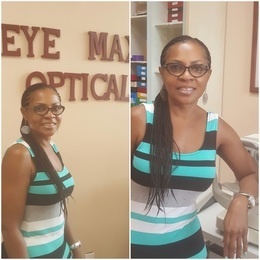 She opened Eye Maxx Optical in September, 2006 and has been in private practice since. ​Dr Petersen has a friendly personality and a knack for making her patients feel comfortable. She conveys a genuine sense of caring while delivering quality eye care and providing excellent service.